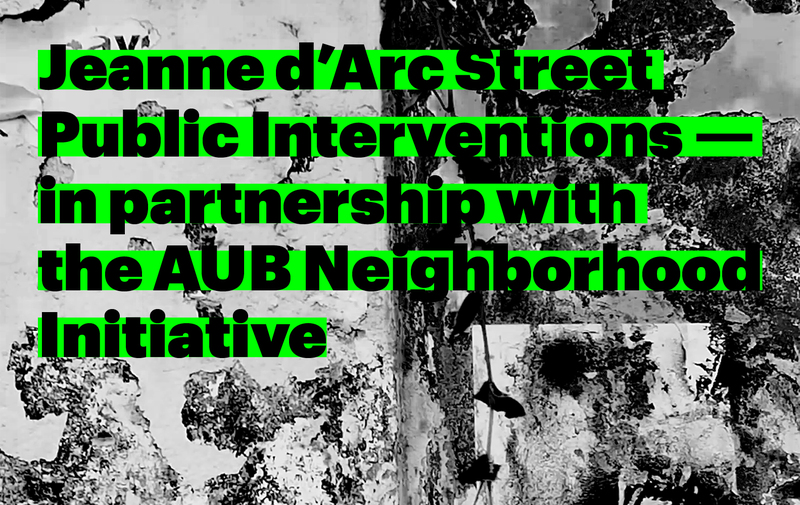 Beirut Design week and the AUB Neighborhood Initiative are collaborating this year to launch a series of interventions activating Jeanne D’Arc street that was rehabilitated as a model street for the city of Beirut. In a joint effort between the Beirut Municipality, the AUB Neighborhood Initiative and the Center for Civic Engagement and Community Service, the street was designed to be inclusive, age-friendly and pedestrian-friendly bringing together residents and businesses, urban designers, and accessibility advocates. We have mobilized designers to create projects, objects, interventions, and performances that will contribute to the rehabilitation of the street to set it as an example to be replicated in other streets around the City. The themes include urban green, urban farming, urban furniture, reading and storytelling, play, collective memory as well as walkability, soft mobility, recycling, and sustainability. All of the projects were produced in partnership with the AUB Neighborhood Initiative and many interventions will be permanent additions to the cityscape. The intention of this project is to evaluate the quality of outdoor built environment in different neighborhoods in Beirut city limit and the level of pedestrian safety and sidewalk accessibility of older adults residing in these selected neighborhoods. The assessment of the interaction of older adults with urban public places and streets in Beirut photographs as a voice for community change. By using photovoice, as an effective tool for illustrating sidewalk and street obstructions, participants aim to reach out decision makers and elected officials to improve the existing pedestrian safety issues relevant to older adults’ ease of access. This is a design intervention that will engage with the residents of Jeanne d’Arc in different activities around the topic of Play in the city. The result will be a playful addition to the neighbourhood’s fabric, a colourful mural reminding the people that their participation is crucial in shaping their environment and that play is important for all ages. Dar Onboz shall weave tales of a neighborhood and its dwellers with a moveable show in Jeanne d’Arc street. Between a stroll a game a nursery rhyme and a tale with Nadine R.L Touma the Hakawati, Maya Fidawi the artist, Sivine Ariss the musician. This urban art initiative aims at highlighting forgotten heritage and patching up traces of the war around the city, using Lego bricks, hinting at childhood and play, and symbolically representing larger construction blocks. We will shed light on the rich heritage, nature and culture in and around Jeanne D’arc street, a form of reclaiming the street and protesting to preserve heritage and cultural sites in the new urban design fabric. The main objective is to get people together, in realizing a change in the city, even if it were small. It is an open invitation, a social experiment. Recycle your old Lego bricks and let’s play in the street! This free library aims to inspire a love of reading and strengthen community ties by encouraging book exchange around the city. It increases access to books for readers of all ages and backgrounds. Anyone passing by can take a book to read or leave a book for someone else to read. The project aims to stimulate all groups of society, especially the youth, to engage in the conservation of native wild plants. This project was carried out through the redesign of an old bus to turn it into a mobile botanical garden. The bus offers different types of wild plants in an attractive way. The mGHBG visits schools and universities and offers the students different programs and activities educating them about the importance of biodiversity and its conservation. Ripple came as a direct response to the staggering amount of paper waste produced by architecture students. The installation was born through self-accountability by realizing what a discarded paper tube meant. Ripple is generated by individually slicing 600 paper tubes which were gathered on a slim period of 3 months from various print labs in and around our universities. Each of these tubes, throughout their lifespan, has held 50 meters by 1 meter of paper in width and length which totals to 30000m2 which translates to 3.6tones of wasted paper used to showcase works which have had no permanence. The paper wave is a wake-up call to re-think and re-evaluate our pointless consumption of paper in this digital age. The statistics on this problem are alarming, however, no one is sounding any alarm bells. The payoff for us is the fact that our creation has now taken a physical space in the world and it has a permanence which will most likely outlast this exhibition. And it's not vulnerable either, unlike its core element, the paper tube, a quasi-object having no substantial meaning, however, if combined with a reason to change and a wise and sensible mind, this vague element can now have a purpose and bring a message through, a message of change. Cars take over free spaces in urban areas and have become part of the status quo. The space that cars use up can be divided into multiple spaces for bicycles which are healthier, greener and less obstructive mobility tools. NK is a conscious fashion accessories brand, made in Lebanon. The brand was born 4 years ago when Nour decided to find a solution for the discarded plastic bags in Beirut. This resulted in a line of products that are handmade, locally produced, water resistant, light, durable and made of waste. We will be holding an open studio where passerby are invited to have a look into our workshop, experience the design and production process, and see end products. Recycling a shell, is an artistic installation that will take place in the Khalidy House, Jean d’arc Street, hamra on June 23rd & 24th in collaboration with the London based sound performer Merijn Royaards. Color-Me-Beirut and The Do-Lab Project come together in a Pop-Up Installation with the intention to promote human interaction through art and play. The concept stems from nostalgic childhood forms of expression and creativity. Visitors will be able to color in a large-scale coloring book that is thematic to Lebanese culture. The art project will gradually obtain color from its original black and white lines, into a colorful masterpiece filled in by the community. Watermelon Circus is a combo between Cultureghem (BE) and Cocinar Madrid (ES). Remixing people, places and a lot of food is what we do. We care about getting people to meet, to trigger a collective food memory and want to cultivate urban space. Mobile kitchens are our weapon of choice and we are always interested in crossing borders. We dream of coming to Lebanon to come and build mobile kitchens with you. With your ideas. For your city. We believe that together we can do magic. We hope you do too? A walk in Beirut can sometimes feel much like a walk in a maze, but the diversions to your target destination are not block-ends and circular paths, but obstacles on the pavement and footpaths. From electric cable boxes to parked cars, to commercial marketing material or badly placed signage, the pedestrian has to be on the constant lookout, alert, and ready to swerve… Experience and explore this sensation in our installation on Jeanne d’Arc St and let’s find and fight for a solution to this endless battle together.